The mod works with the traditional sets as well as the modern RW/RP sets. It's all good. RW/RP middle pups are a non-issue. 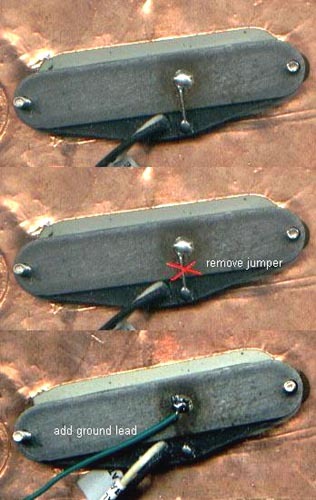 If you have added a metal baseplate to your bridge pup, such a sold by Lindy Fralin or Callaham - a popular mod - IF you installed it following their instructions, it may interfere with the rotary's series and out of phase combos, by offering the bridge pickup another path to ground (baseplate > mounting screws > foil pickguard shield > ground). Fortunately, the fix is VERY simple. Clip the baseplate's jumper (that they instructed you to solder) to the pickup's negative (aka "ground") lead eyelet, and instead add a third and separate lead, to ground the baseplate. Please see this illustration. The new ground lead for the baseplate should go to ground, typically on the back of the volume pot with the other pickup grounds. If your custom pickups are built on a METAL/conductive BASEPLATE, have METAL COVERS, or have exposed metal (braided) shielding, it is important to know HOW that frame and/or shielding is connected to the guitar's ground/shield. If your pickups have metal basplates or covers AND THREE-CONDUCTOR wiring (the pup has three leads), this should NOT be a concern, as the third conductor is usually an independent ground/shield wire. An example of this is the newer Lace pickups, where the orange lead is the coil positive, the white lead is the coil negative, and the green lead is the ground/shield. The green lead would stay soldered to ground - typically the back of the volume pot - and you would use the white lead to connect to any phase or series mods as the coil's negative lead. The bad news: If your pickups have metal basplates or covers with standard two-conductor wiring and your guitar has a fully shielded pickguard, you may find that some of the new combos will NOT work. With ANY setting where the pups are in series OR phase-reversed, you MUST eliminate the pickup baseplate's continuity with the ground/shield of the guitar. This is necessary because with two-lead pickups, the baseplate and/or shield USUALLY has continuity with the negative lead from the pup's coil. That means that in certain pup selections, the baseplate - and anything metal that contacts the baseplate, like pole pieces and mounting crews and springs - is actually on the "hot" side of the signal. Potentially, the entire under-pickguard shield then has continuity with the HOT side of the circuit. This means that when you try one of the series combos, you will probably just be shunting one (or more) of the pups to ground, and it either won't get you the desired results, or, in out of phase settings, it may not sound at all. There are two ways to address this problem with two-conductor wired pickups. One is to change the pickup's wiring (IF POSSIBLE), eliminating the continuity between the coil's "-" lead and the baseplate and/or shielding, but that can be a tricky task. The other - and FAR SIMPLER - way is to modify the Strat's pickguard shield. If your Strat has the simple foil shield on the back of the pickguard, this is relatively easy to accomplish. The object in modifying the pickguard is to eliminate all continuity between the pickguard's foil shield and the pickup's metal parts. This can be done as easily as scraping off the foil around the holes where the pups are mounted to the pickguard in a large enough radius so that the height-adjustment springs (if used) do not touch the foil. Alternatively, if you are sure the holes themselves are clear, you could simply apply a small piece of electrical tape to the bottom of the pickguard to "insulate" the foil from the pup mounting screws. If you use rubber tubing as your height-adjustment spacer, you simply need to be sure that where the mounting screw passes through the pickguard, the screw does not touch the foil. In MOST cases, that will do it! Even though you have cleared the spots on the pickguard shield, and now the switch works as it should, because of the way your pups were manufactured, when you put the pickup in series or out of phase, everything with continuity with the "-" lead is still on the hot side of the circuit - including the mounting screws of the bridge and mid pups. So, when you touch those mounting screws - or the pole pieces of the pup - you are actually touching the hot side of the circuit, almost as if you had unplugged the axe and where touching the tip of the cable. Maybe some non-conductive screws? You should be able to find them at Home Depot or other hardware stores in their "specialty fastener" department (a tip from a FAT-O user). Another band-aid would be to cover the screwtop up with something non-conductive - a piece of tape, a drop of rubber cement, thick paint, clear nail polish??? Anything... ? Of course, this won't help with the polepieces... just don't touch 'em!!! If you have any problems, suggestions, or questions, please e-mail me!